Argyle is a classic pattern that will never go out of style. Everyone should have at least one pair of these socks in the wardrobe. A sock is an item of clothing worn on the feet and often covering the ankle or some part of the calf. Some type of shoe or boot is typically worn over socks. An argyle pattern is made of diamonds or lozenges. The word is sometimes used to refer to an individual diamond in the design, but more commonly refers to the overall pattern. Most argyle contains layers of overlapping motifs, adding a sense of three-dimensionality, movement, and texture. Typically, there is an overlay of intercrossing diagonal lines on solid diamonds. A lozenge (◊), often referred to as a diamond, is a form of rhombus. The definition of lozenge is not strictly fixed, and it is sometimes used simply as a synonym (from the French losange) for rhombus. Most often, though, lozenge refers to a thin rhombus—a rhombus with acute angles of less than 45°. In Euclidean geometry, a rhombus(◊) (plural rhombi or rhombuses) is a simple (non-self-intersecting) quadrilateral whose four sides all have the same length. Another name is equilateral quadrilateral, since equilateral means that all of its sides are equal in length. The rhombus is often called a diamond, after the diamonds suit in playing cards which resembles the projection of an octahedral diamond, or a lozenge, though the former sometimes refers specifically to a rhombus with a 60° angle (see Polyiamond), and the latter sometimes refers specifically to a rhombus with a 45° angle. The origin of the term: The argyle pattern derives from the tartan of Clan Campbell, of Argyll in western Scotland, used for kilts and plaids, and from the patterned socks worn by Scottish Highlanders since at least the 17th century. These were generally known as "tartan hose". Production: As a knitting pattern, argyle is generally accomplished using the intarsia technique. Argyle patterns are occasionally woven. Intarsia is a knitting technique used to create patterns with multiple colors. As with the woodworking technique of the same name, fields of different colors and materials appear to be inlaid in one another, fit together like a jigsaw puzzle. Unlike other multicolor techniques (including Fair Isle, slip-stitch color, and double knitting), there is only one "active" color on any given stitch, and yarn is not carried across the back of the work; when a color changes on a given row, the old yarn is left hanging. This means that any intarsia piece is topologically several disjoint columns of color; a simple blue circle on a white background involves one column of blue and two of white—one for the left and one for the right. Intarsia is most often worked flat, rather than in the round. However, it is possible to knit intarsia in circular knitting using particular techniques. Argyle socks and sweaters are normally done in intarsia, although the thin diagonal lines are often overlaid in a later step, using Swiss darning or sometimes just a simple backstitch. Take your sock game to a whole new level by completing a smart look with some dress socks featuring the timeless argyle pattern. Preppy to perfection. You may also want to learn about women's argyle sweaters. 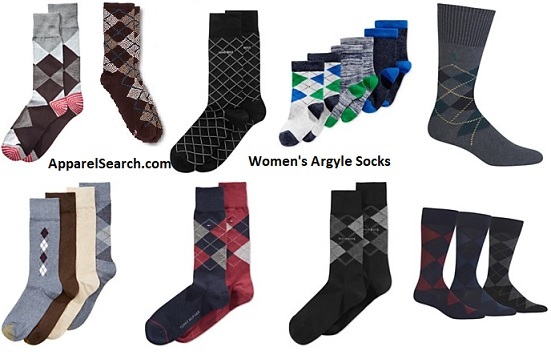 If you enjoy cotton, you may want to also visit the women's cotton argyle socks page. What ever style of hosiery you are wearing is in fashion.